Social network sites including Facebook and Google+ doesn't support some type of files to post like .exe and audio files. If you want to post your audio files on your Google+ account, you have to use some third party tools. SoundCloud is a popular online audio streaming site that allows users to upload, record, promote and share their own audio files. With SoundCloud you can post your audio files on different platforms including social network sites like Facebook. 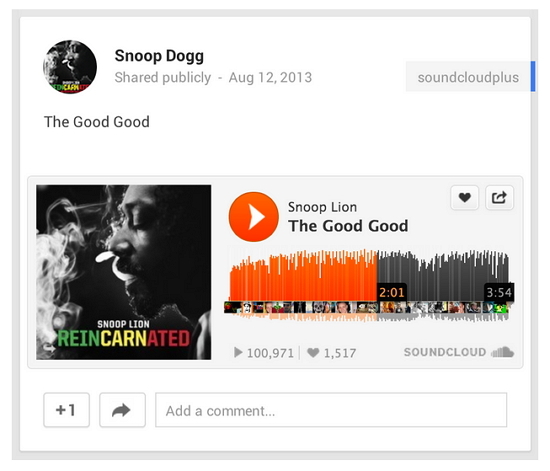 With new Google integration SoundCloud now enables users to share their audio files on Google+ site. Go to SoundCloud.com and sign in to your account. If you don't have the account create new account for free. After your files uploaded successfully click on the Save button. Go to your Google+ account and paste the audio URL and finally share it to your Google+ friends.